This last weekend we visited the small town of Vernal Utah. Vernal Utah like make rural areas of Utah has gems and breathtaking views. 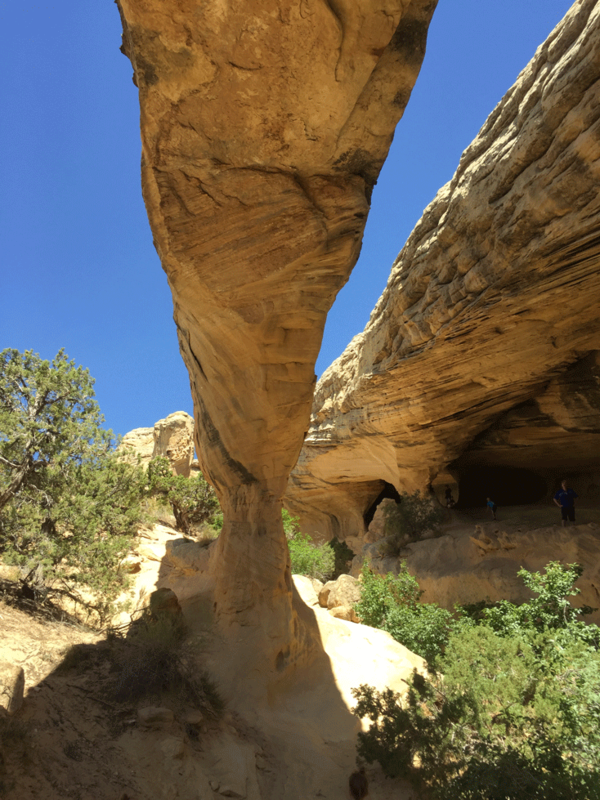 The main attraction is The Dinosaur National Monument. I’m going to share with you our experiences. 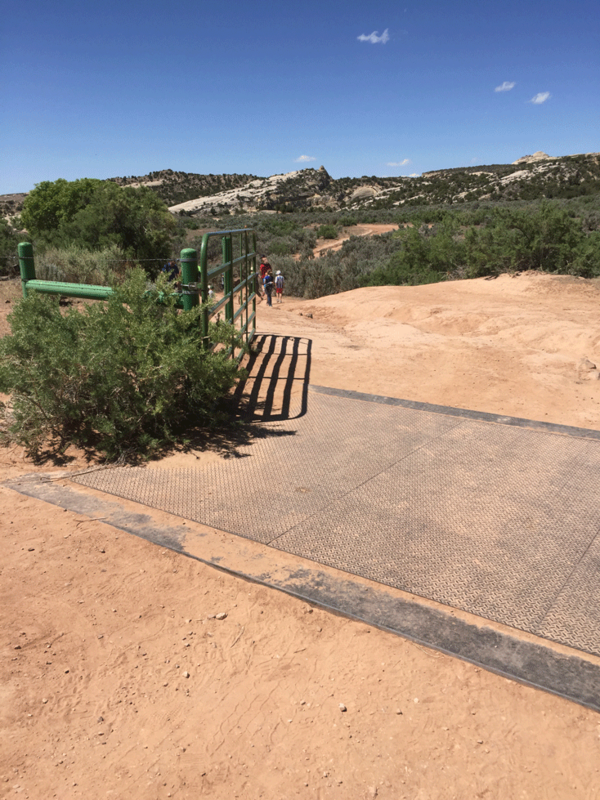 There is a KOA within the town of Vernal and other campgrounds within the Dinosaur National Park.You will need to schedule these campsites in advance to ensure that you get a spot. 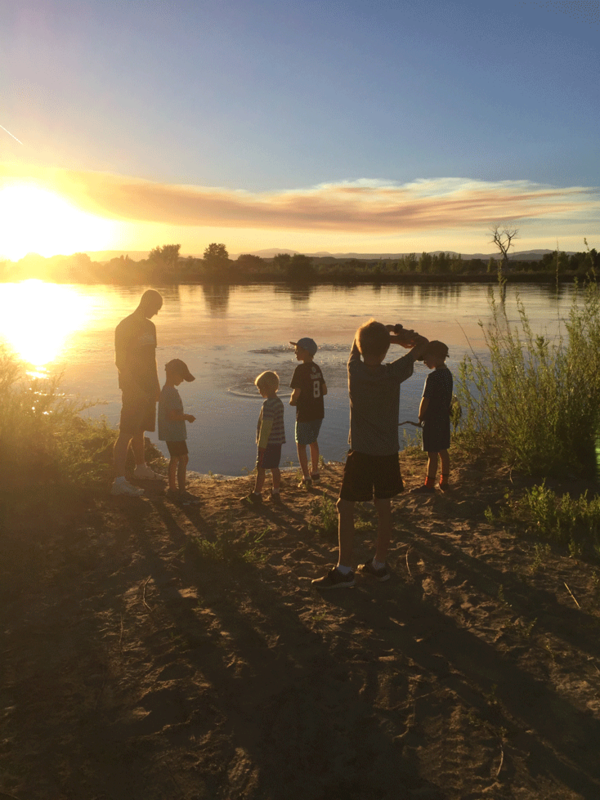 We prefer to dry camp and pick a spot that allows our boys to explore the world around them without too many restrictions from neighboring campers. We found a fun place just past the turn off to the dinosaur quarry you will cross the Green River. There is a road that turns right and all along the rights side by the river are fantastic spots to dry camp. There was plenty of dry fallen wood for a campfire as well. The river at sunset is beautiful as well! My only piece of advice here to to wear bug spray. There are a lot of little bugs out to get you, but my boys LOVED it! Here is a little background information on the layout of this park. There are two entrances that do not connect. One entrance is in Vernal Utah, and the other is in Dinosaur Colorado. We decided we wanted to check them both out. 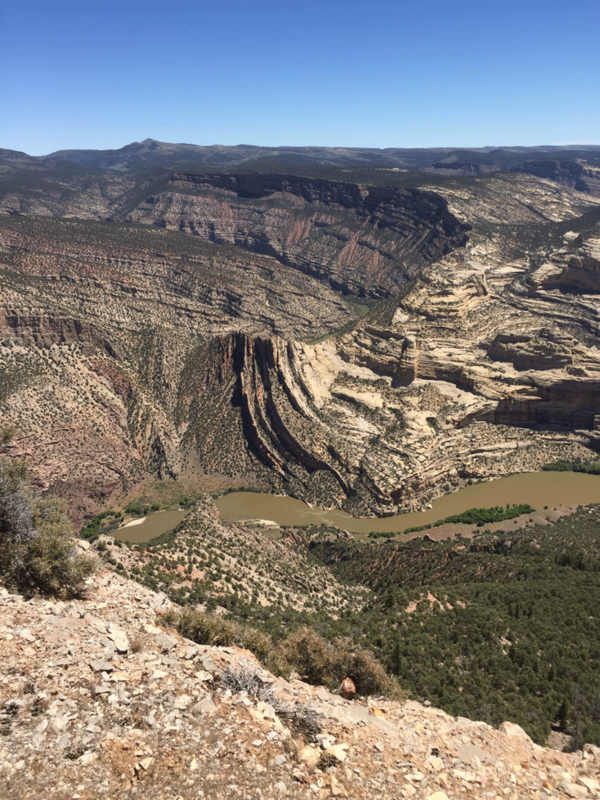 It will take you about 30 minutes to get to the Colorado entrance of the Dinosaur National Monument from Vernal. From here there is a Visitor Center that you can go in a visit and read up on the area. There is a short video you can watch here as well. After the visitor center there are a couple hikes you can take in this canyon. Make sure you grab a map while you are at the Visitor Center to help direct you. This is a paved trail, handicapped accessible and 0.25 of a mile long. This hike is a 9.2 mile hike round trip. The trail head will be off the Island Park Overlook on the left hand side as you are driving up Harpers Corner Road. 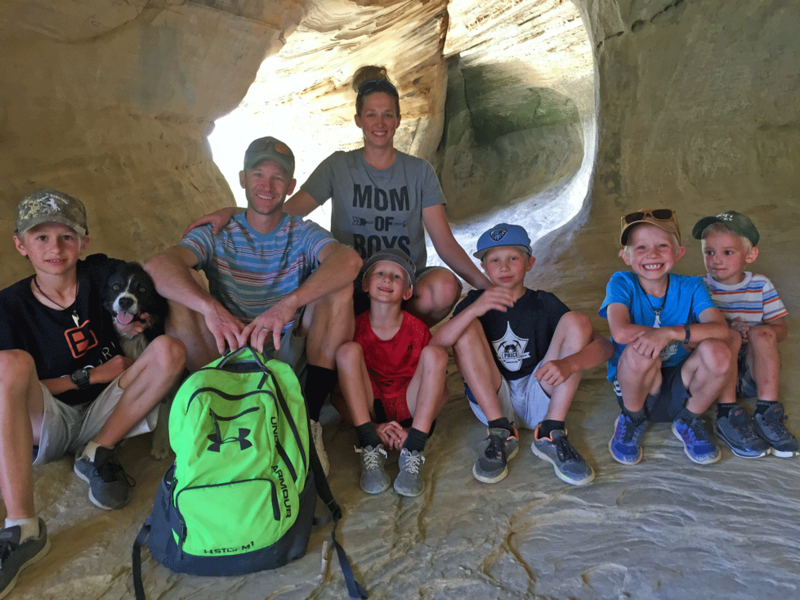 We decided not to do this hike with all of our little kids but looked like a lot of fun! This hike is at the end of road of Harpers Corner Road. It is close to a 2 mile round trip hike. This was totally doable with my 5 boys and the view was totally worth it. You can see the Green River down in the depths of the canyon. You could see how over time mountains have shifted and displaced from their original place in time. Some vertical while others were bent. My son and I were busy identifying plants along the way as well which was a lot of fun. 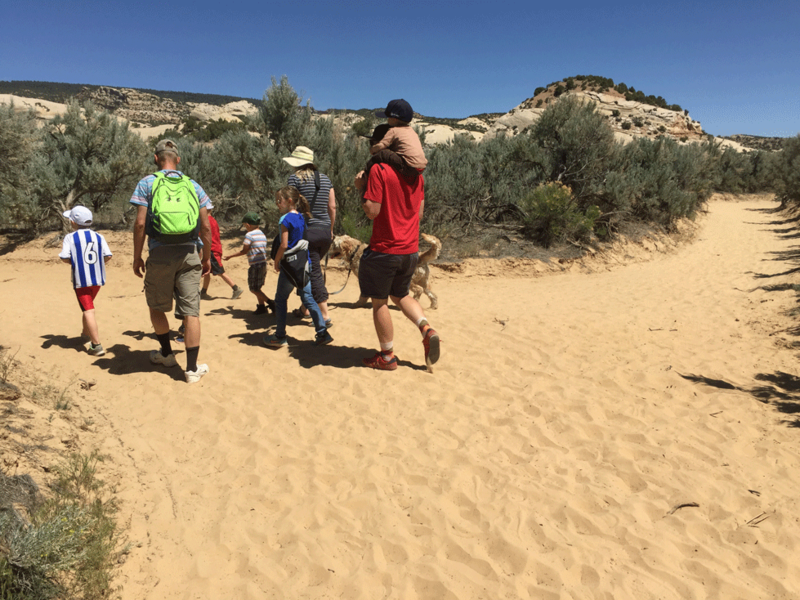 At the beginning of this hike you can donate a $1 and get a guide that will teach you about the many things you will see on this hike from the trees, plants and geological information a long the way. I found it very informative and interesting. We went in the spring so the flowers were all in full bloom so the ride to this place was beautiful. There are no dinosaur bones on this side of the park. Upon entering this park there is a visitors center that has a bunch of information you can go check out. 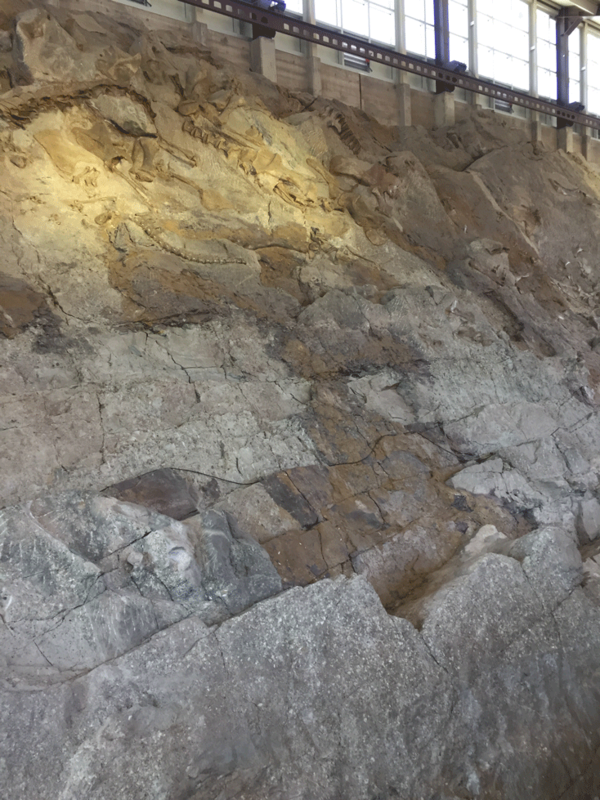 From the visitor center there is a tram that will take you up to the Dinosaur Quarry (from the months of May-Sept). Or you can drive/hike up to the quarry. Again if you have a $1 they have a booklet that is very informative. There is lots of rangers there to ask any questions you have. Within the quarry there are over 1500 bones in this wall that are still in their natural state of when they were found. It is really fascinating. They have a portion of the wall that you are able to touch and feel these bones. Very cool. There are two levels to this quarry. On the upper level they have some screens that you can touch and find out which bones come from what dinosaur and where on the dinosaur it came from. My boys were fascinated so make sure you take the time to check these resources out. If you rode the tram up to the quarry, I suggest taking a mile hike back down the bottom. 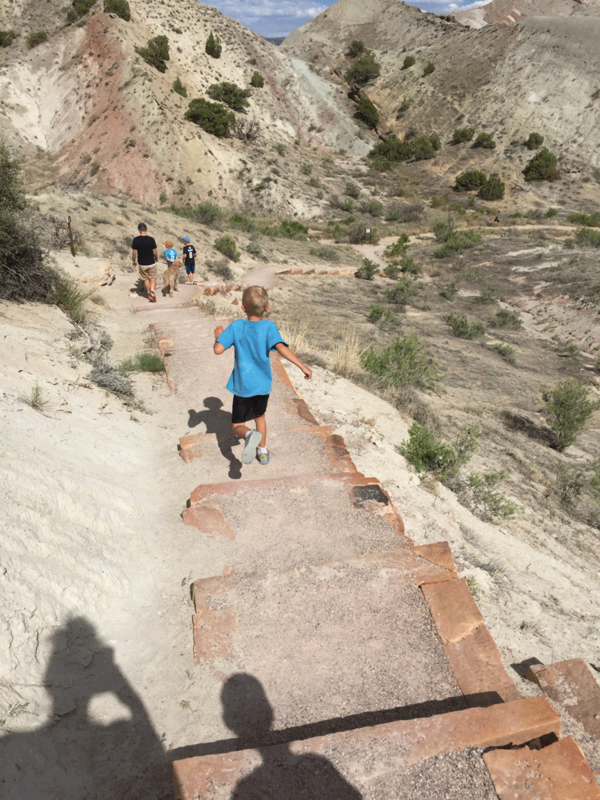 This hike is called Fossil Discover and is a fun hike. You can see signs of marine life and dinosaur bones a long the way if you know what you are looking for. 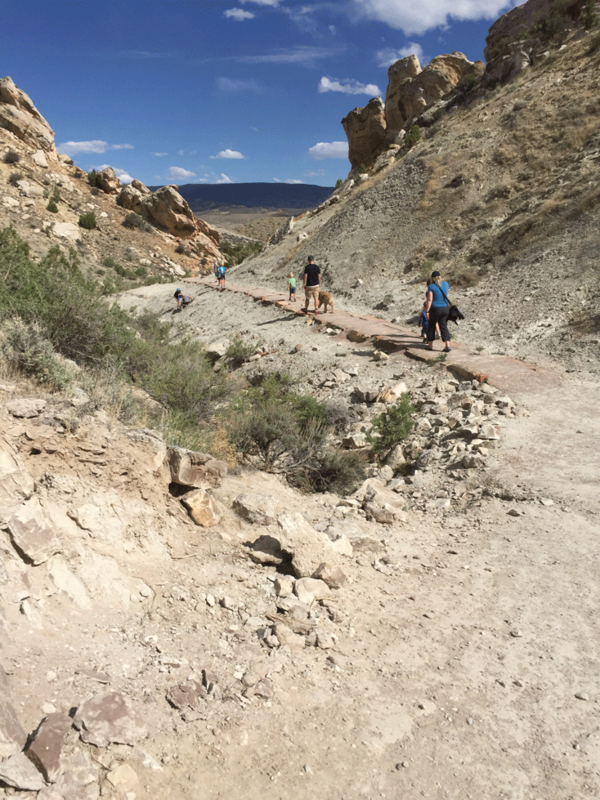 One thing I found interesting on this side of Dinosaur National Monument was how the layers of earth that have been formed over the different time periods have been pushed into a vertical direction so as you are driving to the visitor center check out the mountains on the left. You will see layers that are different colors and textures. It is actually fascinating. As you drive up to the quarry notice on either side of the road as you “travel through time”. Each cutaway of ground is different than the last. If your not looking for it, you may not notice it so keep an eye out! Another hike that looked fantastic but didn’t have time was the River hike. It is a 3 mile round trip and is a trail that follows the Green River. You can find all of these trails on a map, and if you ever have any questions ask a ranger. They are everywhere! This was such a fantastic hike. 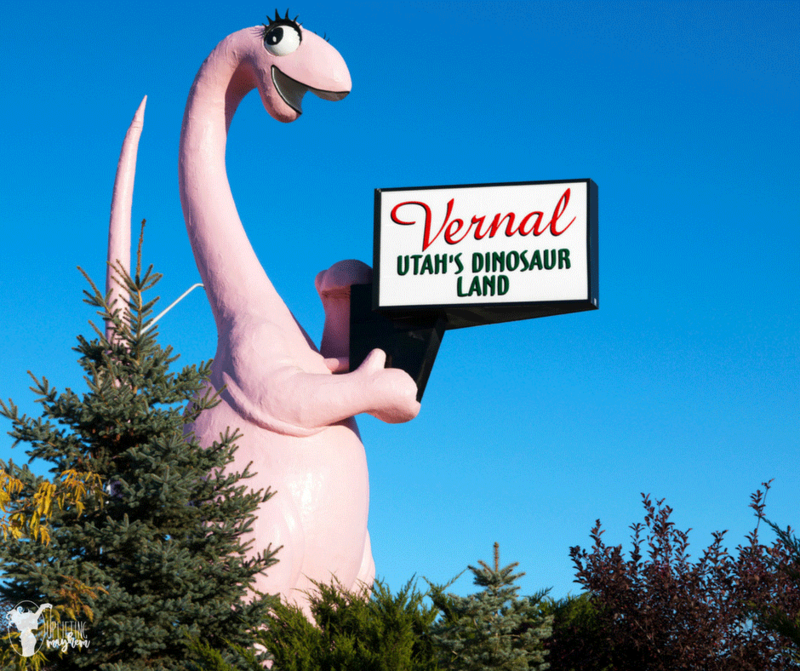 It is not within the Dinosaur National Monument, but it is within Vernal. The hike wasn’t super long (which was good because my 4 year old had a melt down and wanted to be carried). The path is really sandy during the first part, and rocky and uphill during the second half. It is about a mile long to get to the arch and totally worth it. If you put it in your GPS it will take you to the wrong place. Go ahead a put it in your GPS and when it tells you to turn left to Steinaker State Park near the end, don’t. Continue driving another mile or so down the road and you will turn off onto a dirt road just shortly after mile marker 359 (4 posts past this mile marker to be exact). There will be signs to point you in the direction you need to go. You will make 2 lefts and then you will arrive at the “parking area” by a green gate. Just as you go through the green gate you will go down a steep hill. Follow the path (there are some shortcut paths you can take that is off to the right that will bypass the curve). Once you are on the path, when in doubt stay left. You will come to a couple Y’s, when you do keep left. The arch is BEAUTIFUL and really nice and cool underneath the overhang. My boys loved it! I will definitely do it again. Really fun. Felt so good to rest in the shade. It was a great place to cool down. Some others saw a rattle snake just off the path, so just stay on the path and you should be good! 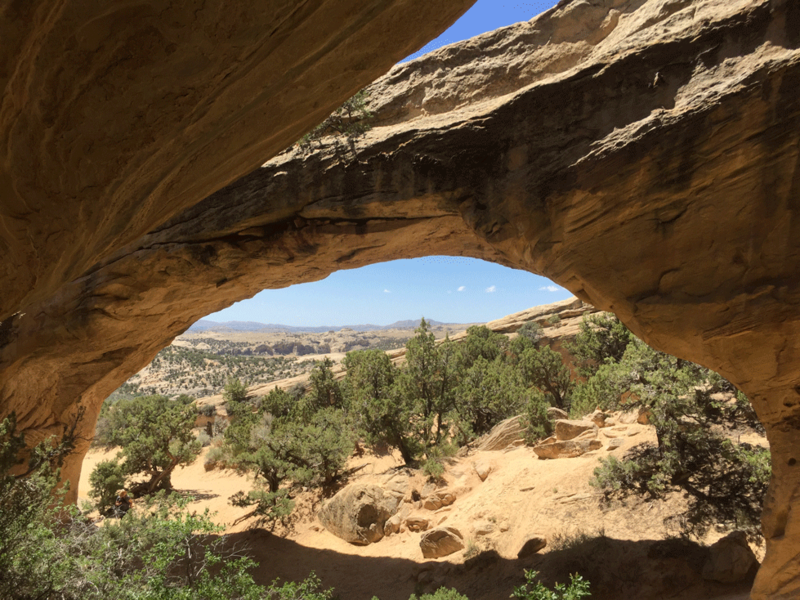 I hope you have fun while visiting the Dinosaur National Monument and Moonshine Arch. I hope our little journey will help you and your family have a fantastic time!